The Victor 9000 / Sirius S1 was conceived by Chuck Peddle who also designed the first Commodore PETs. 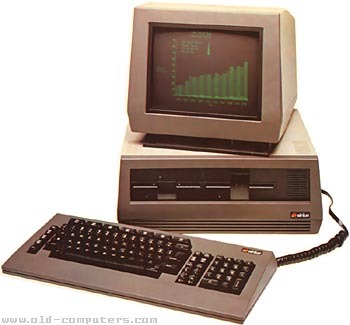 This machine was quite innovative and superior in many points to the original IBM PC. It met a certain success in Europe as the IBM PC was not yet available there, whereas the Sirius S1 (european name of the Victor 9000) was. ACT sold a lot of these systems in UK, and their first "homemade" computer, the Apricot PC, borrowed a lot to the Sirius S1. The mechanical keyboard is very complete and has its own 8035 cpu. The 12'' monochrome monitor is equiped with an anti-relflection filter and can be adjusted horizontaly and verticaly. Contrast and luminosity are controlled directly from the keyboard. The computer can display text ranging from 80 x 25 to 132 x 50. But the best feature is the high resolution reaching 800 x 400 pixels! The Victor 9000 is equiped with a Codec which can sample and replay sounds in telephone quality. There are two V24 / RS232 ports and one parallel connector which can also be used as an IEEE-488 interface (to connect measurement instruments for example). There is also an optional light-pen, which is in fact a touch pen using resistive mesh on the CRT. The two 5.25" disk-drives are single-sided and offer 600 kb each. But double-sided models were available as an option and offered 1.2 Mb each. The Victor 9000 was perhaps best known for how it was able to achieve such high density on it's floppy disks. It used variable speed disk drives; there were 9 different speeds used. As the drive head moved outward the speed would increase. It was really neat to hear the speed change as the drive head moved. The Victor 9000 could run with MS-DOS or CP/M 86. Many languages were available: Basic 86, C-Basic, Cobol, CIS-Cobol, Pascal, Fortran, PL1, PLM, etc. ; as well as some software: Wordstar, Spellstar, Mailmerge, Multiplan, etc. Victor came to the computers competition much better prepared than most new entrants of the time. First of all, Victor was a subsidiary of Kidde Inc., a three billion dollar conglomerate. Second, Victor had experience in designing and manufacturing microprocessor-based electronic products. The company had been making calculators for 60 years. Third, Victor had a great deal of experience in dealing with business people and the needs of contemporary office. Fourth, The Victor 9000 distribution was supported by a network of 50 branch offices in the U.S.A.
Fifth and perhaps most important, the chief designer of Victor's machine is not a novice but Chuck Peddle, a founder of the microcomputer industry who knows how to bring maximum performance to the market at an affordable price. The variable speeds on the floppy drive were very distinctive and when I was at college there was a program available called "Drive Music" that accessed different sectors of the floppy to play tunes. We got into trouble for using it on the college machines. On boot up it used the sound hardware to say (in an American voice) something like: "I am the ACT Sirrius One, the number one choice in business computers." Andreas Tauscher is incorrect in his posting regarding disk capacity...the technical information listing is correct. Chuck achieved very high capacity diskettes through the use of constant bit-density. He did this on the Victor/Sirius machine through variable speed drives but he had done it before on the Commodore products through variable clock rates. see more Sirius Computer Victor 9000 / Sirius 1 Ebay auctions !